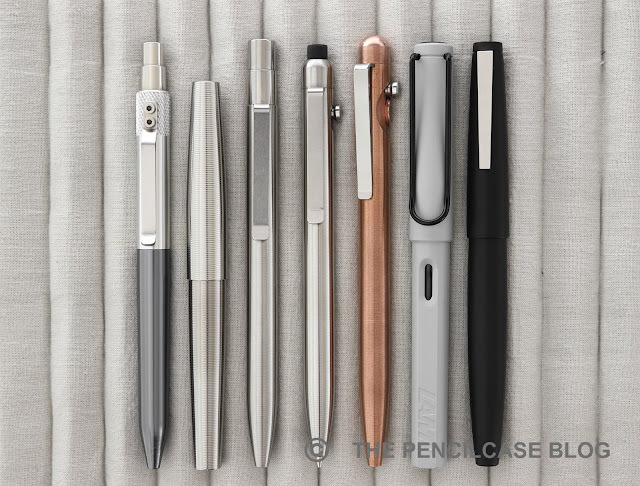 In my fascination for metal pens I've already come across a bunch of interesting brands, and have tried some truly excellent products in the process. Suprisingly, there was one brand that has always been on my radar, yet for some reason it took me until now to finally check them out: Tactile Turn! A couple months ago, I bought a titanium Tactile Turn Gist fountain pen from Mike Dudek (of The Clicky Post and Dudek Modern Goods fame!). Shortly after, by coincidence, I got in touch with both Will (owner of Tactile Turn) and Sascha (who owns German-based online store 'Writing Turning Flipping', one of few EU-based retailers that stocks Tactile Turn!). Suffice to say you'll encounter quite a few Tactile Turn products here on the blog in the next few months! I thought I'd start by taking a look at the Glider -sent to me by Writing Turning Flipping-, which has consistently been part of my daily carry in the past couple months. The Glider is something new for me, as I had never used a bolt-action pen (which are quite popular in the EDC community). As the cherry on top, Sascha sent it over in one of my favorite metals: copper! The Glider in beteen the Mover and mechanical pencil, notice the subtle difference in shape of the Glider. 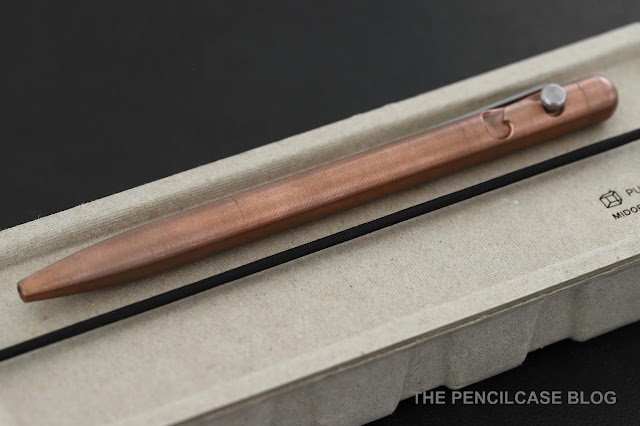 The Glider is one of two bolt-action pens Tactile Turn makes: the Glider and Slider. The Glider is about 0.5" longer and therefore takes another refill, but otherwise they are identical in design. The Glider is a large but sleek and streamlined pen. It strikes a good balance between minimal and industrial design. The barrel tapers gently into the nose cone at the front and at the rear end of the pen is a rounded finial where you'd usually find a knock mechanism. 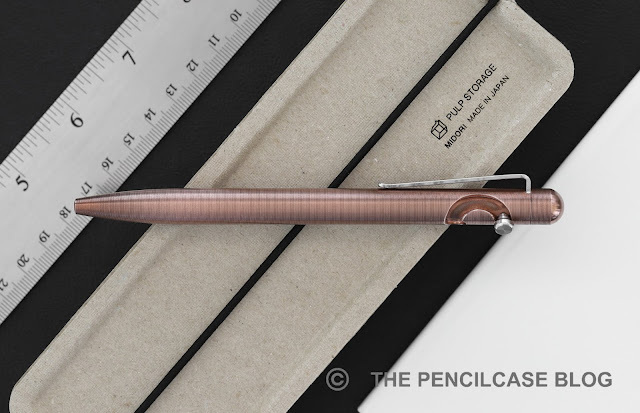 But this is of course a bolt-action pen, and the mechanism can be found on the right next to the clip. It's a nicely rounded semi-circle shape with a small stainless steel bolt that doesn't protrude too far out from the barrel so it doesn't really sit in the way. The mechanism takes some getting used to, but once you get the hang of the 'swooping' motion (in lack of a better explanation) it almost becomes second nature. It's also EXTREMELY addictive to fiddle with. Seriously, once I pick it up, I have a hard time putting it back down. That said, it's not necessarily the most practical mechanism to quickly deploy and jot something down, but it sure does look cool. If I had to really nitpick on this pen, I would've liked to bolt to travel a mm or two further down so that the tip of the refill extends just a hair further. Of course that's easy to fix, I just taped a small piece of plastic to the back to give it that little extra length. 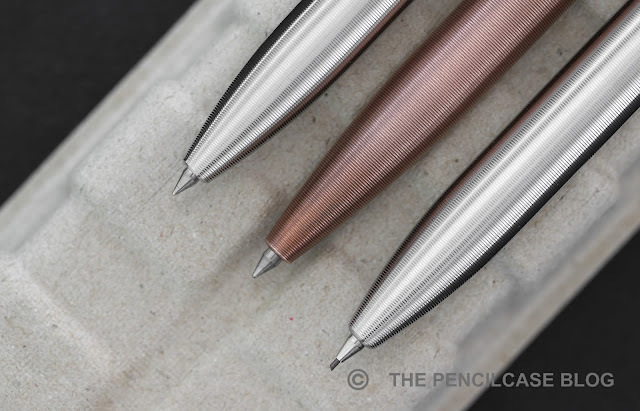 Basically all Tactile Turn pens share two specific design elements: the machined ridged texture across the entire surface of the pen, and the sturdy folded stainless steel clip. 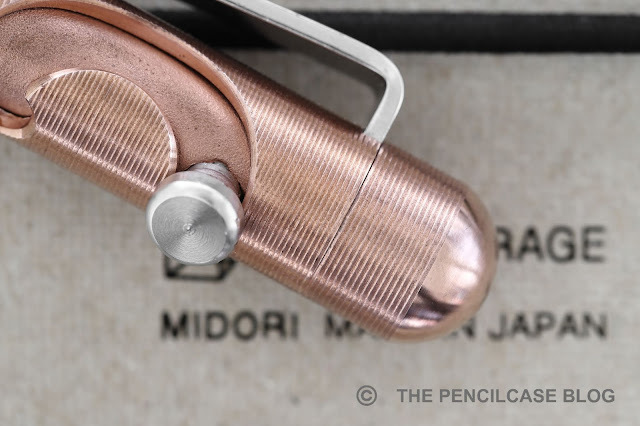 While this type of clip is something you can see on a lot of EDC-minded pens, it's attached internally instead of bolted to the outside of the barrel. 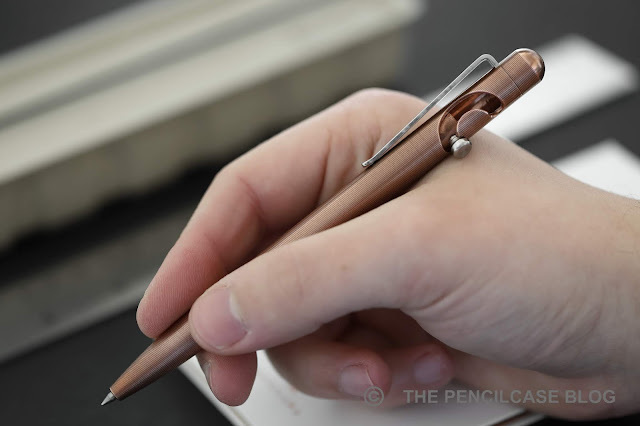 The 'tactile' surface finish -what's in a name!- gives the pen a unique satin matte appearance from afar, and also provides excellent grip in the hand. As I said, I chose the copper finish, which is hefty and creates a wonderful patina with use. If you're not a fan of copper, Tactile Turn provides plenty other metal options to choose from (aluminium, brass, titanium, stainless steel, damascus steel or even zirconium! ), each with their own unique character and feel. The Glider is a large pen, measuring in at 14.2cm (5.6"), and with a comfortable 11mm (0.43") diameter across the entire body of the pen. In this copper finish, it's a hefty 65g. For comparison, the aluminium is only 26g, and the titanium comes in at 36g, so that's quite a big difference in weight (there are a few other metal options to choose from, which have slightly different weights). Even though this copper version is heavy, it's very nicely balanced and I rarely had issues with fatigue. The combination of the surface texture, good size and nice heft makes this a very comfortable pen. I've used it for long writing sessions without any issues. One thing that stands out in all Tactile turn products, is that they are made with an excellent eye for detail. The design is considerate and machining is impeccable. Fit and finish is so good on these pens, that you'll have to look very closely to spot the seam where the two halves of the barrel meet. 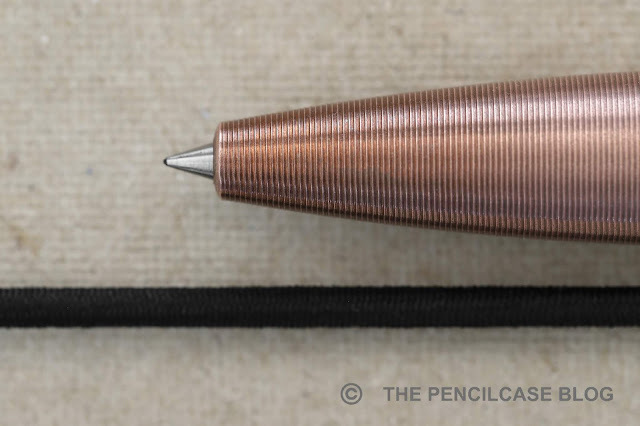 The knurled texture is consistent across the entire pen, and apart from providing grip it also helps to hide small scuffs and scratches from use. The Glider is an allround excellent pen with an impeccable level of detail in the machining. There's really just one caveat: the mechanism on this pen is so addicting to play with... it may drive people around you crazy! Making it even easier to recommend is the price. The Tactile Turn Glider is competitively priced when compared to direct competitors like the Karas Pen Co. Bolt. Prices obviously vary depending on the metal you choose: the aluminium version starts at 60$ (65€), this copper version is 70$ (75€) and the titanium Glider comes in at 80$ (85€). The more exotic finishes, like DLC-coated titanium, damascus steel and zirconium, obviously command a rather hefty premium. This product was sent to me by Writing Turning Flipping so I could write this review. I was in no way influenced in the making of this review, the opinions shared in this review are completely my own! This post does not contain affiliate links.